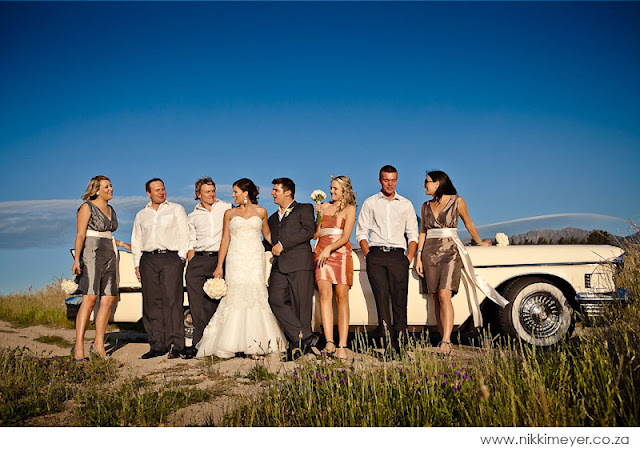 I just had a look at the beautiful photos that Nikki Meyer took of Nico and Dala's wedding. As i said last week , the venue was stunningly decorated. The weather was gorgeous, the bride breathtaking and the shots that Nikki took definitely something for the couple to treasure for many years to come! For more pics, have a look here. I made these as part of the dessert platters for an end of year function last week. Topped with brie and a sliver of green fig preserve - DELICIOUS!!! I love the green fig and cheese combo, one of my favourite indulgent snacks. I usually put the two on digestive biscuits, but the spicy ginger is a welcome addition to this flavour combination - it works beyootifully :) For some extra indulgence - sprinkle or drizzle a bit of dark chocolate over... hmmm decadent! Read here for the how-to. Delicious carrot cake with cream cheese frosting and a generous helping of hazelnuts! Yesterday i was asked for my carrot cake recipe. I love carrot cake because of the nuts and the spices, it's just got that little bit more depth than vanilla or chocolate. Another great thing about carrot cake, as i said earlier in the week, it is lovely and moist and stays fresh for longer. On Friday, Dala and Nico celebrated their marriage at the beautiful Kleine Valleij in Wellington. Their theme, French Chic, was beautifully interpreted in the table decor and suited the atmosphere of the venue perfectly. Everything was light and fresh and very elegant. I made them carrot cake and cream cheese frosting cupcakes. Decorated with a light grey ribbon to tie in (excuse the pun ;) ) with the rest of the decor. The great thing about carrot cake cupcakes is that they keep their moisture for much longer than do vanilla or chocolate. Perfect for a hot Summer's day in Wellington! Cake no.2 was for Mika - mini cheesecakes with fresh berries. Also a perfect choice for a Summery wedding. The zesty berries are so refreshing and a cheesecake is a cool and light alternative to other baked cakes. Yum yum yummm. I love cheesecake and i LOVE berries - it took a lot of self-control not to eat her cakes before delivering them! Snowflakes are definitely à la mode this festive season!! And very much in keeping with the fresh and earthy tones that make up this year's Christmas palette. DIY is in and i feel that the personal touch in decorating your home or in giving gifts is a necessary part of the warmth of Christmas. Here are a few lovely ideas and designs to help you warm up your home and the hearts of those near and dear. 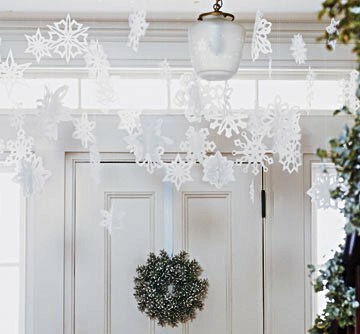 This wreath made from snowflake doilies will create a wonderful welcome if hung on the front door. Otherwise hang it in an entertainment area as a significant decor point. A string of Christmas lights was used in the making of this wreath, but those little battery-powered LED lights will work just as well. And then you don't have to worry about where to plug it in. 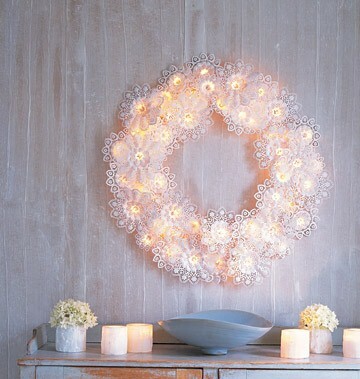 Another option is to place candle holders in the wreath and use it as a table centre piece instead! Click here for the how-to. Don't these hanging snowflakes just look sooo Christmassy! Suspend them from a chandelier, your Christmas tree or make a mobile. You could use pieces of drift wood or twigs as the frame for the mobile. For a bit of sparkle, spray the twigs with a bit of silver spray paint! I am always a sucker for anything heart-shaped! 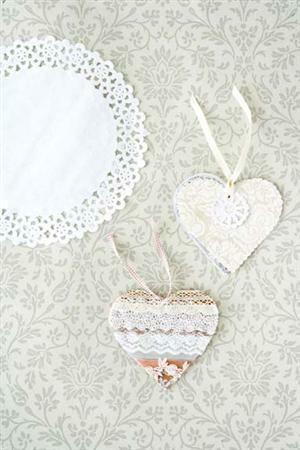 I saw these delightful doily-hearts on the Ideas Mag website. They will make gorgeous Christmas tree decorations, stick them onto Christmas cards or use them as gift tags. For scrap booking enthusiasts, it's a great way to use up all sorts of bits and pieces that you've accumulated. 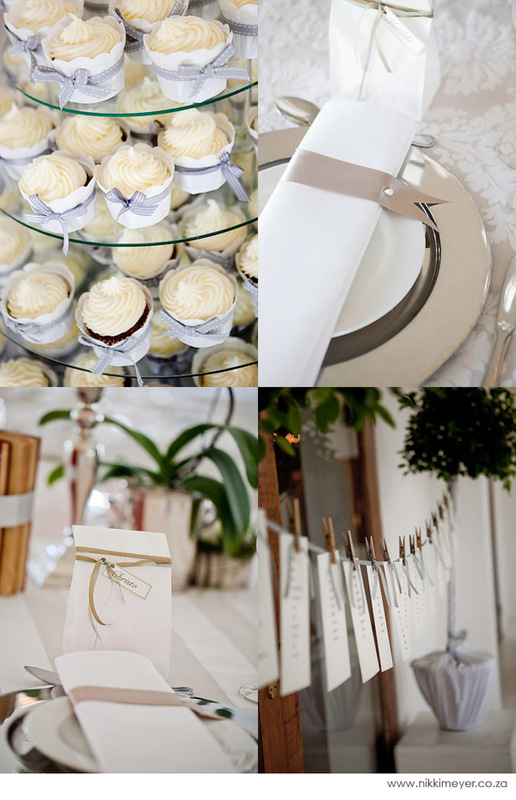 You can even use scraps of ribbon and lace to add that vintage touch! To get the kids into the holiday spirit, get them involved in the process too. These 'love knots' are an integral component of the traditional German Christmas Cookie plate! They taste of deliciously of vanilla and are a nice contrast to the other Christmas biscuits that are all rich and spicey! Although they are quite time-consuming, the recipe for the dough itself is easy and the end result is definitely worth it. Sift the flour and baking powder into a bowl. Create a well in the middle, to which you add the sugar, egg and milk. Gradually incorporate the flour into the mixture in the middle. Cut the butter into blocks and knead into the mixture to form a nice firm dough. Wrap in plastic wrap or place in a container and refrigerate for approximately 30 minutes. Roll out pieces approximately the width and length of a pencil. Fold into the 'pretzel' shape and place on the baking tray. Bake for 15 minutes. For the glaze: mix 100 g icing sugar with a bit of brandy or rum and the seeds of 1 vanilla pod. Once the biscuits have cooled, dip them into the glaze and place on a cooling rack to dry. And then.... enjoy all your hard work!! These are best enjoyed with a fresh cup off coffee or a fresh glass of egg nog! When Melisha came to me with the picture of her dream wedding cake, i could barely contain my excitement!!! Since seeing a version of this anemone cake in my favourite cake recipe book (refer: Spring Has Sprung), i have been longing to make such a cake. In less than two months we celebrate my favourite celebration. Christmas has always been an important time for our family. Planning and preparations start long in advance and much effort is put into gifts and baked goods to let those that are special to us know just how special they are. To help you with your preparations, for the month of November, i will be blogging all things Christmassy - loads of Christmas bakes, recipe books to add to your Christmas wishlist, interesting ways to decorate your feast table etc.